Rezorect 154 Steel Putty is a trowel-applied, medium abrasion resistant putty, designed to repair and rebuild steel parts and equipment. It protects against entrained particulate abrasion, and wearing surface abrasion, and contains the maximum loading of specially sized and treated steel particles. The combination of the steel particle reinforcement, with the corrosion resistant epoxy resin alloy, offers outstanding performance in the areas of abrasion, friction reduction and turn-around time. While 154 Steel Putty is designed to be cured at ambient temperature, when practical, it may be post cured by several methods to accelerate complete cure, thus placing coated objects in service in a much shorter time. The non-sagging, non-shrinking properties permit application to vertical surfaces, cavities and intricate parts. When cured, 154 Steel Putty may be machined with standard tools. Only the highest quality resins and reinforcements are used to produce Rezorect materials, assuring the applicator of long lasting successful applications, when correctly applied. Will not sag or run when applied to vertical surfaces. 100% solids and will not shrink. When used for non-corrosion service, single coat applications are possible. Specially treated and sized steel reinforcements create a smooth and continuous surface. User friendly material is easy to mix and apply, reducing application time and returning equipment to service with shorter turnaround. Repairs to ferrous metals and aluminum. 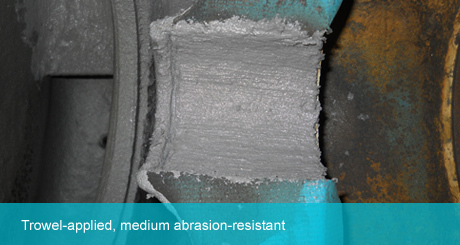 Advanced adhesion properties assure long lasting protection without fear of undercutting or delamination.